Some Options Are Now Standard And Gas Mileage Improves. Is That Enough Change Against Redesigned Rivals? The navigation system becomes standard on the top two trim grades and internal revisions help V-6 versions gain 1 mpg in fuel-economy ratings. Some minor juggling of equipment rounds out alterations to this midsize sedan that is the Japanese automaker’s best-selling vehicle. Because a midcycle freshening is likely and would bring updated styling and features and perhaps add a hybrid model to the lineup. The appearance changes would likely run to a revised nose and tail. The hybrid system could well be the one used in the company’s Pathfinder SUV, a rather unusual but effective combo of a supercharged four-cylinder engine and a battery-powered electric motor. Today’s generation of this five-passenger four-door was all-new for model-year 2013. The ’16 changes would aim to stoke showroom interest as it heads toward its next full redesign, probably for model year 2018 or ’19. If you want a solid sedan that delivers good to great fuel economy (depending on engine choice), plenty of passenger and cargo room, and a wide range of features at competitive prices. Also aboard is NissanConnect, which brings it up to speed with rival infotainment systems from companies such as General Motors, Honda, and Toyota. You can still get a V-6 engine in a class where that’s not universal. Of course, you won’t have the latest styling or gizmos. But the ’16 won’t be drastically different, and you’ll avoid the inevitable model-year price inflation. No, although beige interior-equipped models receive black carpeting and lower seat side trim; you’d be surprised at how much richer they look, not to mention how much more resistant to showing dirt. Even without change, this car’s exterior remains remain distinctive enough, if relatively conservative compared with, say, the more flamboyant Ford Fusion or even the restyled 2015 Toyota Camry. Nothing wrong with that; the shape is in the service of spacious passenger accommodations. Also unchanged is the model roster. It divides by engine type, with four-cylinder versions labeled 2.5 and available in base, S, SV, and top-line SL trim levels. With the V-6 engine, the grades become 3.5 S, 3.5 SV, and 3.5 SL. The base 2.5 is aimed at rental and commercial fleets, not retail customers. No movement here, either. The four-cylinder line gets the lion’s share of sales, with most buyers happy with the 182-horsepower 2.5-liter’s mix of adequate acceleration and impressive fuel economy. You won’t find a six-cylinder engine in a Fusion, Chevrolet Malibu, Mazda 6, Hyundai Sonata, or Kia Optima, to name some top competitors. But Altima’s 3.5 line belongs to a list of holdouts that includes the Camry, Honda Accord, Subaru Legacy, and Volkswagen Passat. This 270-horsepower 3.5-liter is more of a workhorse than a creamy-smooth high-performance engineisn’t as smooth at some of its rivals. But it’s a proven alternative to the turbocharged four-cylinders the others use in place of a V-6, and it gives up nothing to them in fuel economy. No automaker relies as much on the continuously variable transmission (CVT) and that’s the only type you’ll find in this car. Like all CVTs, the Xtronic unit developed by this carmaker delivers power like a rheostat rather than via a set of stepped gear ratios. Some latecomers to this technology, such as Honda, have CVTs that seem to work in better harmony with their engines than this one does. But it’s not a deal breaker, especially mated to the V-6, where the presence of more torque reduces its tendency to force the four-cylinder to sustain a buzzy, high rpm plateau as you accelerate rapidly or use lots of throttle to merge or pass at freeway speeds. Some competitors take corners with more precision, but every Altima delivers a laudable balance of secure handling and comfortable ride. These are front-wheel-drive cars; for the all-season traction of all-wheel drive you’ll need to look at a Fusion or Buick Regal, where it’s optional, or to the Legacy, where it’s standard. Here, every model has alloy wheels, 16-inchers on the 2.5 S, 17s on the 2.5 SV and SL, and 18s on all the 3.5 versions. Yes, in V-6 models, thanks to reduced friction inside the engine and the CVT, and addition of exhaust-variable camshaft timing, among other tweaks. It isn’t much – just 1 mpg in highway and combined ratings – but don’t tell that to engineers or the marketing department, who know any gain is hard-fought these days. The new ratings are 22/32/26 mpg city/highway/combined. The four-cylinder stays at 27/38/31 mpg, quite good given this car’s size and mission. Not so much new as redistributed. 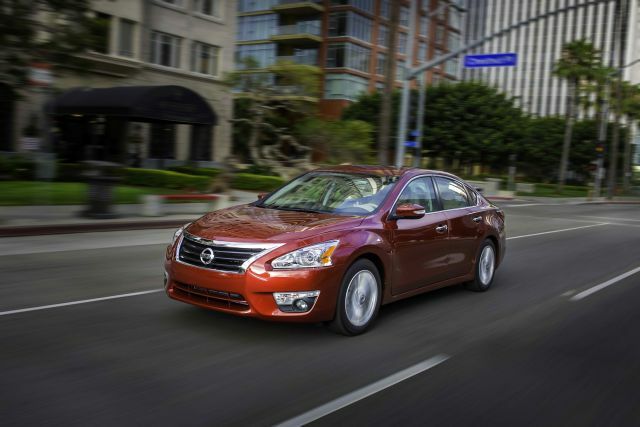 The deluxe version of NissanConnect with navigation, along with blind-spot and lane-departure-warning systems, moves from the options list to the standard-equipment roster on the 3.5 SV and 3.5 SL models. Other enhancements run along the same lines: An 8-way power driver’s seat and 2-way power lumbar support for 2.5 SV and 3.5 SV models, 4-way power front passenger seat for SL models, and automatic climate control on all SV and SL trims. The 2.5 SV gains standard fog lamps. As for returning features (and leaving out the fleet-oriented base 2.5 model), the 2.5 S has Bluetooth hands-free cellphone connectivity and audio streaming, keyless entry with pushbutton engine start, curise control, and a 60/40 split/folding rear seatback. Also standard is the company’s cleaver Easy Fill Tire Alert, which sounds the horn when you’re inflating a tire to let you know you’ve reached the correct pressure. The navigation setup with its 7-inch touchscreen is again included in the Technology Package option for 2.5 SV and SL models. A rearview camera and a USB port with iPod connectivity is optional on the 2.5 S and standard all other models; same for basic NissanConnect with its onboard access to Faebook, Pandora, and iHeart Radio apps. All SVs and SLs have a power sunroof and universal garage door opener. All SL variants have leather upholstery, heated front seats and steering wheel, and a Bose-brand audio system, among other luxury-oriented amenities. Mirrors integrating LED turn-signals are optional on the 2.5 SV and standard on the 3.5 SV and all SL models. They increase modestly but remain competitive enough to be a selling point. Base prices here include the manufacturer’s destination fee, in this case $810. The rental-intended 2.5 model is priced at $22,670, but the 2.5 S you’ll find in retail showrooms begins at $23,190. Base price is $24,990 for the 2.5 SV and $28,570 for the 2.5 SL. The 3.5 S starts at $26,970, the 3.5 SV at $29,170, and the 3.5 SL at $31,470. Among popular options, the Convenience Package for the 2.5 SV costs $1,350 and includes such goodies as the moonroof, rear passenger air conditioning vents, the turn-signal mirrors, a front passenger window with one-touch power operation, and an automatic-dimming rearview mirror. The Technology Package for the 2.5 SV and 2.5 SL costs $1,090. In addition to the navigation system, it includes the blind-spot and lane-departure alerts. NissanConnect Apps allows users to check Facebook, Twitter, E-mail, and text messages through the touchscreen audio display. Download to your phone, then hook it up via Bluetooth (Google Android phones) or USB (Apple iPhone) to access these services. Note that some functions are included for only the first three years of ownership, after which an annual fee of $19.99 applies.